It’s summertime folks. Let’s all take a backseat to being serious and let our hair down and deep freeze our favorite cocktails. That’s right. Snobbery be damned: I froze some Negorni cocktails. And they were TASTEEEEE! Now, please stay with me on this. First, shake off your assumptions that suddenly the lofty Negroni has gone the way of the 7/11 slurpee machine: believe me, this is nothing like that. Gone are the teeth-tinglingly sweet frozen drinks you’re used to downing in the summer. The wasted calories of footlong, electric blue “adult” slushies that have about a thimble of alcohol in them and more corn syrup than anything else. These frozen versions of the Negroni take the actual, delicious drink, and whiz it up with ice for all of the bittersweet flavor, only now you sip it through a straw. 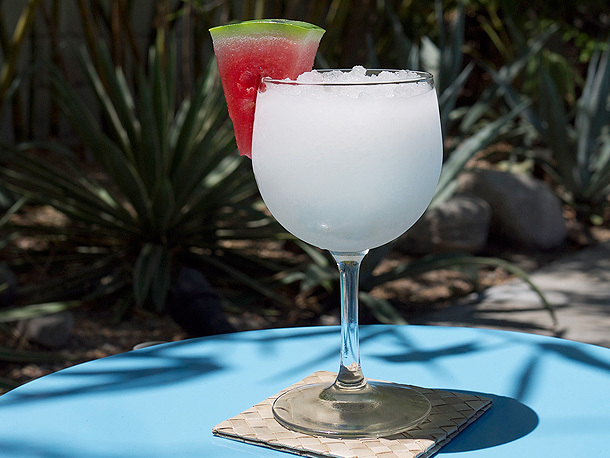 Oh, and when I say versions, I mean you get TWO variations for this frozen cocktail: classic and a fruit-forward twist on a white negroni: watermelon. The watermelon version is inspired by a drink I just had at a friend’s wedding which was, essentially, a White Negroni whose vermouth had been infused with watermelon. The idea was playful and it was delicious and I knew I needed to make something like that for the site. Lately, I’ve been enjoying a bit more whimsy in my cocktails, I still enjoy the classics, but when you’re recipe developing all the time, your brain wants to go in warped places. At least mine does. Anyways, the idea was great, but I wanted some flexibility with the recipe. And since I wanted something a bit more versatile that I could use in multiple drinks, I infused the gin instead. It’s a short infusion, just two days, and you could always start tasting after day 1 if you don’t want a super-watermelon-y flavor and strain when you think it’s ready. Hint: if you want something over ice, instead of something made of ice, try the watermelon gin with some tonic; the sweet and bitter work well together. OK! 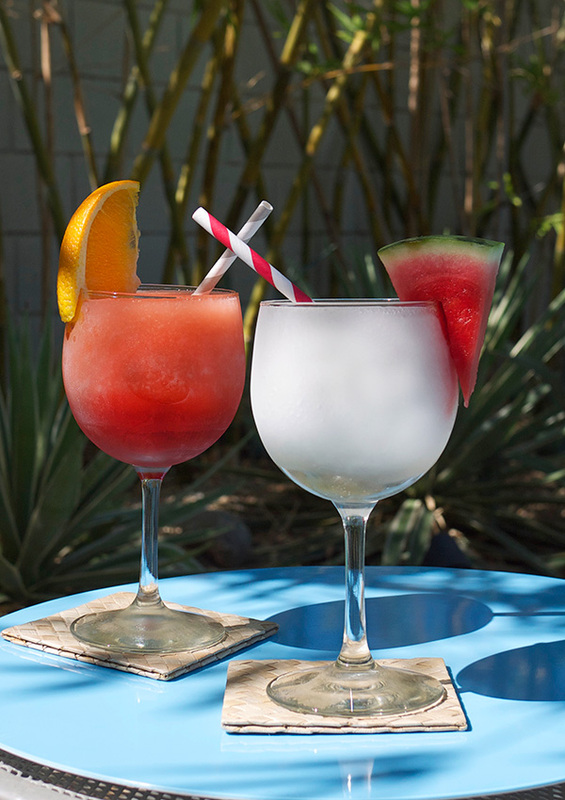 So let’s stop taking ourselves SO seriously, at least for today, and enjoy some frozen cocktails. 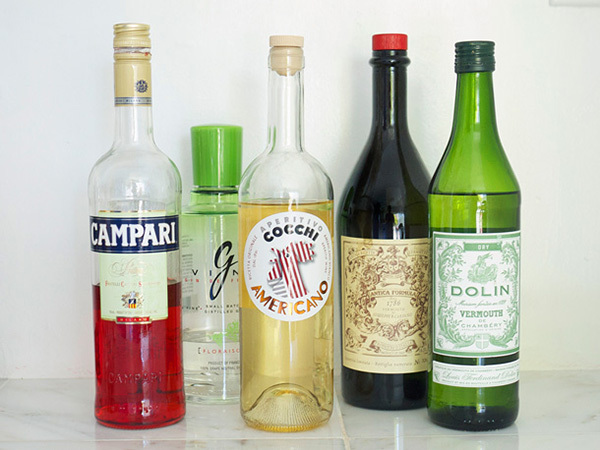 Combine gin, Campari, and sweet vermouth in an airtight container. Place in freezer and freeze for at least 8 hours and up to 3 days. When ready to serve, add chilled alcohol and ice to blender. Blend on high speed until uniform and smooth, about 30 seconds. Pour into rocks glasses or small wine glass. Garnish with an orange slice and serve immediately. 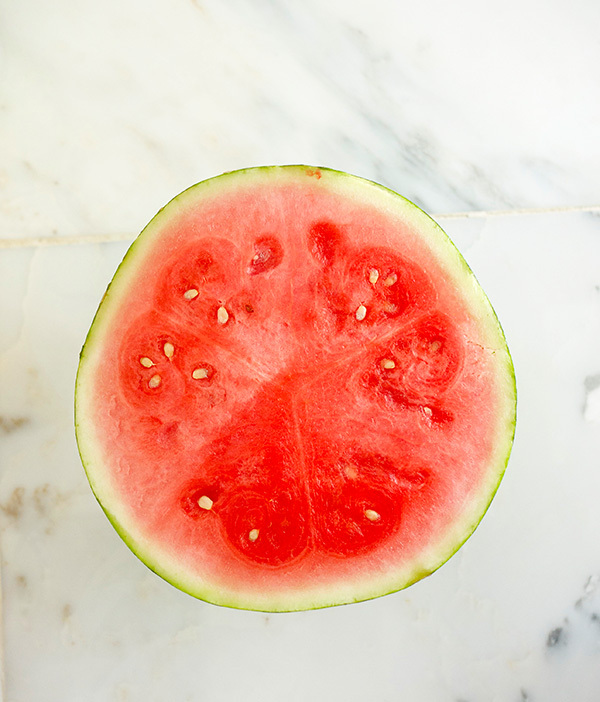 For the watermelon gin: In an airtight container, combine gin and watermelon. Keep in a cool, dark place for 48 hours. Strain into a clean, airtight container until ready to use. Will keep up to one year. For the Watermelon White Negroni Slushie: Combine watermelon gin, Cocchi Americano, and vermouth in an airtight container and freeze for at least 8 hours and up to 3 days. 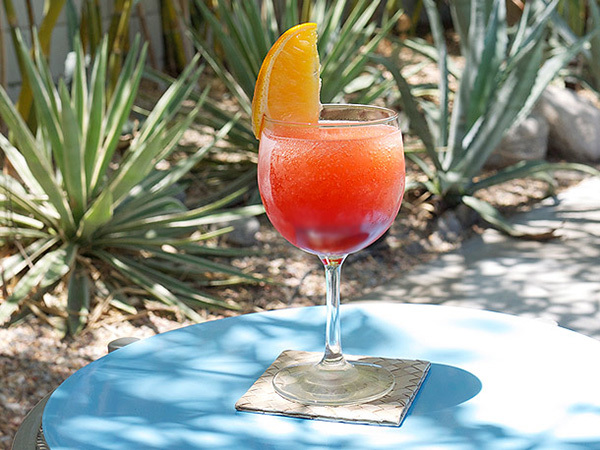 When ready to serve, add frozen alcohol to a blender with ice. Blend on high speed until smooth, about 30 seconds. Split between rocks glasses or small wine glasses. Garnish each glass with a watermelon. First, drink these with an ounce of caution; they kinda go straight to your head if you sip them up quickly. Second, the chilling overnight is so your mixture does not dilute the ice too quickly while you blend (this step is optional). The classic Negroni tastes pretty much like what you’d get in its natural state. Even though the bitterness is still very present, with this icy state it’s lovely and the citrus notes are quite present. And not watered down tasting! The watermelon on the other hand is delicate with only a hint at the bitterness from the Cocchi Americano. While the fruity watermelon is present, it doesn’t overpower the drink as a whole – it’s a nice accent. So choose one, or both, to make this weekend. I choose both. I originally published this recipe on Serious Eats. Previous Post: « MxMo: Pineapple Gomme Syrup and a Pisco Punch!